Everywhere Stories: NOW SHIPPING — Enter to win a bundle of signed books! 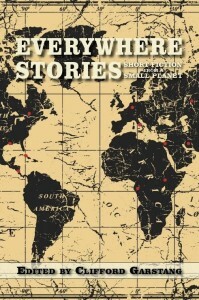 I am very excited to learn that our anthology, Everywhere Stories: Short Fiction from a Small Planet, is now shipping from the publisher. The book is a collection of 20 stories set in 20 countries by 20 authors. It’s really a terrific book. Travel invigorates and enlightens, and so does reading. You don’t have to go to the Congo to gain an understanding of the challenges women face there. You don’t have to go to Costa Rica to learn about resentment toward fly-by evangelism. You don’t have to go to Iran to sample Persian culture and anguish. When it’s done right—as the stories in this anthology are—fiction can transport you and show you the essential details, the soul of a place. A fiction writer is like an archaeologist in that way, digging, brushing away what doesn’t belong and revealing what a casual observer—a tourist—might miss. Read the book. Explore the globe. But remember, it’s a dangerous world. CONTEST: Many of the book’s contributors have published books of their own. The publisher of the anthology is gathering a bundle of some of those books, signed by their authors, and will hold a drawing on October 1, the official publication day, for a winner from among those who order the book from Press 53 during September. What a great prize this will be! So order now: Order Everywhere Stories from Press 53.